Are you a soon-to-be bride but you just can't seem to figure out the kind of jewellery you want to wear at your wedding? Well, these latest bridal jewellery trends might help you make a decision! A wedding outfit alone doesn't make a girl look like a bride. It is only after she is decked up in all her bridal finery that she starts looking like one. And her bridal finery mainly includes the bridal jewellery. If you are a soon-to-be bride, then you have a lot of decisions to make about your look. You have to first and foremost pick out your wedding outfit. Once that is done, you move to the next most important part of your look - the bridal jewellery. The kind of jewellery you pick totally depends on your outfit and the kind of style statement you want to make on your big day. If you are a no OTT kind of girl, then you can opt for minimal and classy jewellery. But your wedding day is all about you and so you can choose to go all out with your look. Well, here are some of the latest bridal jewellery trends that we think will be a big hit in 2019. Take a look and make a well-informed choice, girlie! Chokers have been a favourite with brides since 2018. But this year it's all about experiment with them a little bit. Instead of just opting for a simple choker necklace, why not pair it with a longer necklace and add some oomph to the look, eh? Ever since the Bollywood divas Deepika Padukone, Sonam Kapoor and Anushka Sharma opted for heavy and royal jewellery for their respective bridal looks, the Maharani necklace and other heavy and traditional jewellery pieces have become the latest bridal jewellery trends now. 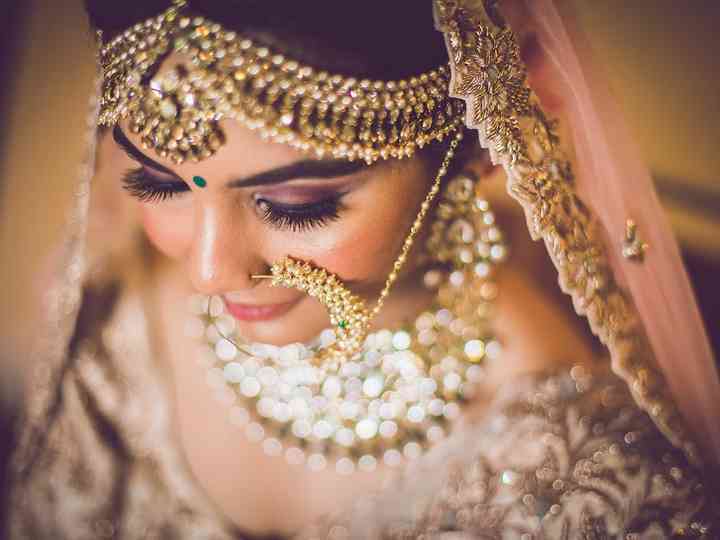 Oh, classic just never goes out of style and thus, more and more brides are now opting for plain gold jewellery instead of going the Kundan, Polki or diamond way. Maybe it's time for you to don the family heirloom then? There was a time when Passas were a staple for Muslim brides. But once they came into notice, many brides started opting for these gorgeous hair trinkets too. Passa are a huge rage this wedding season too and thus make it to our list of latest bridal jewellery fads. Temple jewellery like you guessed is the kind of jewellery South Indian brides wear on their wedding day. But now it's not just the South Indian brides who are opting for it. Temple jewellery is THE latest bridal jewellery trend this year as brides are pairing it with their wedding outfits even in other parts of the country. And why not? It looks so royal and elegant, anybody would love it! You can always experiment with it a little, picking jewellery that has a similar style to that of temple jewellery but has some Kundan stones and coloured beads to match your wedding outfit. So cool, right? Floral jewellery is old news, 2019 is going to be all about these light, gorgeous-looking floral Kalire. These trinkets have a very significant meaning for Punjabi brides. But these days many brides from other cultures are opting for them too, just because of how pretty they look. So, why not ditch those heavy metal ones and give these babies a try, yeah? Payals are back in fashion and even though they are not directly visible from under the wedding outfit, brides are opting for some really pretty and intricate Payals for their big day. If nothing else, they add a certain charm to that bridal photoshoot. The days of extensive and huge Naths are almost over. They look gorgeous but prove to be a nuisance at times. They get in the way of you talking and eating and can be a pain, honestly. So, keeping in mind that they have to enjoy their wedding day just as much as everyone else, brides are going for sleek and stylish when it comes to picking a Nath for the wedding look. Contrasting jewellery is not the latest bridal jewellery trend per se, mostly since it has been around for quite some time now. It's just that over the years, the contrasting colours have become more bold and experimenting. So instead of the same old green beaded jewellery with any coloured outfit, brides these days are experimenting with other colour combinations like pink with red, yellow with pink, and so on. Now that you know almost all the latest bridal jewellery trends that are going to be a rage in 2019, we are sure you will be able to pick the best bridal jewellery for your big day and rock it like a boss bride! Got any questions about your bridal jewellery? Drop us a word in the comments below and we will be happy to answer them!